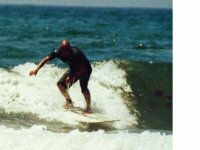 My Best Ever Session: imessouane session with my friend aki, march`07, both had 400m rides seven in the morning, alone at the spot with 7ft perfect waves. Most Recent Contest: ...what did competition bring us??... too much commercialization...!!! Make and Technology: fine polyesther long one!! My Opinion About: Longboarding ROCKZ!!! My Opinion About: never a shortboard again!!! Favourite Music: it`s all about rock`n roll, baby!! 1963 Guests have visited this profile..